It’s been a wild week, wagering-wise. And for Wednesday, I briefly considered heading to the gym. Who knows what would have transpired? I liked Shayna’s Penultimate Wager (although I haven’t really looked into it). Everyone’s going to have some mind games to deal with. If Matt doubles his score, he’ll have 30,400. To cover this all-in wager, Shayna will need to wager 11,700. An incorrect response with that wager will leave Shayna with 7,000. To stay above her total, Matt can wager up to 8,200. Pat can wager up to 1,200. A successful doubling will put Pat at 16,400. To cover this, Matt should wager at least 1,200. Shayna could wager at most 2,300. Pat would need to wager at least 5,800. That means all-in; I prefer this approach. 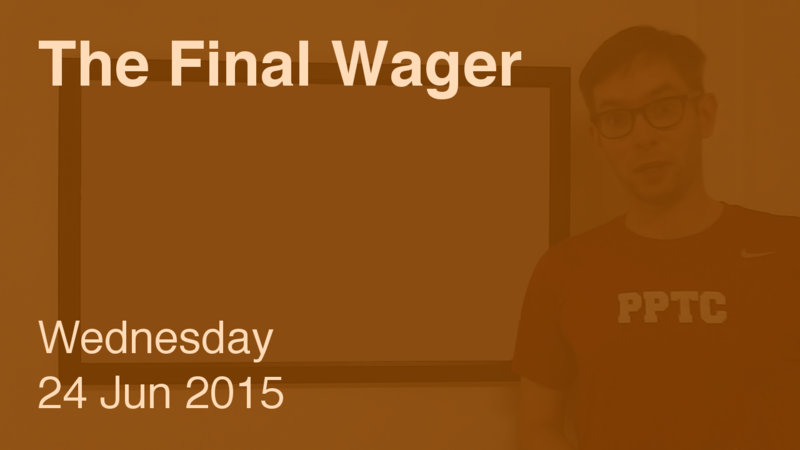 If Matt makes the rational maximum wager of 8,200, Shayna will need to wager 4,700 to cover him. If she’s wrong with that wager, she’ll be left with 14,000. To stay above her, Matt can wager up to 1,200. This gives us our first wager-to-tie range. If Pat goes for that 1,200 amount, Matt could stay above him with a wager of 5,800, while it’s 9,300 for Shayna. Note that to cover an “unsafe” (or “Colbyesque“) wager from Shayna, Matt will have to wager 7,000 – exactly the amount by which he leads Pat. Impressive wagering by Matt – he clearly knew what he was doing. Well done, sir. Shayna, not so much. If she wanted to play conservatively, she should have risked no more than 2,299 to keep Pat out of contention. Matt has now won 2 games and $36,000, and I deem his the second-best wager this season after Christine Kim’s True Penultimate Wager in January. Who was F.W. de Klerk? Analysis well done-kudos. I was watching and immediately I knew something was wrong with her wager when she ends up losing by $2. Frankly, it always amazes me about the effort that contestants put into their knowledge of trivia yet so often their knowledge of math and general odds and dollar counts is so lacking. Further, and I know this might be an unpopular take but I see it a lot on the show, a lot of the females on Jeopardy are beyond ultra conservative with their wagering (like this situation) and it almost seems like they actually want to lose in order to maintain the social order. Really. > And don’t worry, you’ll be getting a video soon.